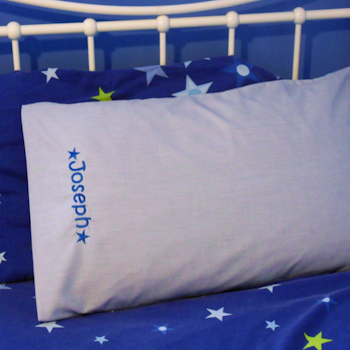 Kids grey-blue pillow case with your choice of personalised name, nickname or initials embroidered in fun kids lettering and your choice of added motif. Kids grey-blue pillow case with your choice of personalised name, nickname or initials embroidered in fun kids lettering and your choice of added motif. A stylish original gift for kids big or small.